As I wrote “Making Friends Out of Blog Readers” over at the Muffin, the song kept going through my head (and going…and going…and going). The thing is, I’ve made a lot of friends because of the blog. Oh, they might’ve started out as readers, but many have ended up as friends, golden friends who’ve been a huge blessing and support through the ups and downs on this writing path. 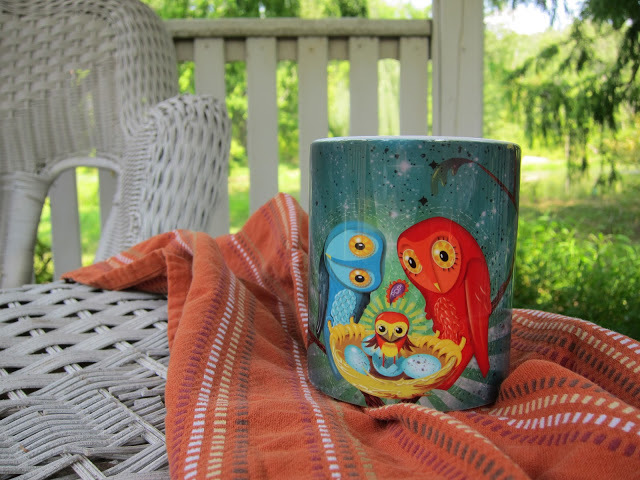 I won the mug from illustrator, Lori Keehner, who was over at Kathy Temean’s blog, sharing her art (and having a giveaway). If you write for children, you won’t want to miss Kathy’s blog, Writing and Illustrating. But she also shares non-children’s writing stuff, like the Peyton Prize, a no-fee essay contest. You’ll want to make friends with Kathy Temean (and follow her blog!). So now I have the mug on my desk and I will fortify myself with a nice cuppa every day and hope that a little owlish wisdom will infuse my writing. Thank you, Lori! And thank all of you who keep coming back to read blog posts and share your ups and downs, both the writing and non-writing ones. I so appreciate the friends I’ve made over the years, and if you want to know how you can make friends out of your blog readers, then zip over to the Muffin to read that post. Oh! And sorry about that song that’s stuck in your head now. Thanks for sharing and for your kind words. You’re very welcome, Kathy. Thanks for all YOU do! The cup is so cute. And thanks a lot. Now I have that song stuck in my head… and it’s been more than four decades since I’ve thought about it. You don’t sound very sorry. Off to The Muffin! Ditto to having that song stuck in my head, but it’s better than having the lyrics to Iron Butterfly’s In-A-Godda-Davida rumbling around. Oh, darn, too late.